Click either image above or here and before to download so it's yours forever. And scroll all the way down to book a complimentary move me call to personalize all a this. Meditation. You hear it's *good for you* and *can change your life* but the bigger question is how? Especially in our whirly swirly modern days, sitting with our legs crossed under a banyan tree for hours is not only uncomfortable, but also highly unlikely. 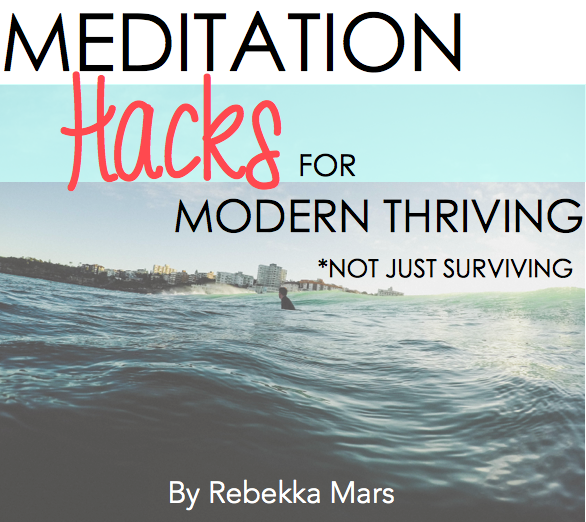 Enter: this little Meditation Hacks Ebook with added skill work and exercises, With refreshing ways to start meditating ... NOW. Explore ways to meditate that are accessible and, yes, enjoyable. Get yours today at no cost, just for members of the Mantra Transformation Challenge. BONUS! FREE move me CALL! Ready to TURN UP your living? Amplify your already there greatness and feel more balanced, empowered, and full of life at the same time? Sign up for a Move Me Call where I will give you actual strategy to implement NOW to change your life. Because sometimes E-Books just aren't enough.